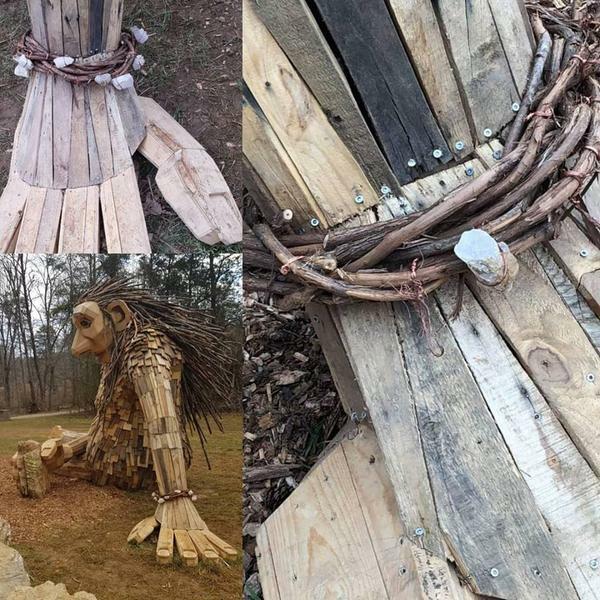 Thomas Dambo's giant sculptures are meant to be at Bernheim Forest for at least three years, but within the first week of their public display, one of the installations has already been vandalized. Dambo posted on his Facebook page Friday morning that Little Elina, one of three sculptures he recently built at the local forest, was missing the majority of large stones from her bracelet, which he believes were taken by guests. Dambo's post also follows some other recent complaints from forest visitors claiming to have witnessed many children and adults mistreating the artwork by kicking, smacking, climbing and throwing items at the creations. While there are currently no signs posted prohibiting visitors from climbing on sculptures, forest officials say those who come out to see the giants should treat them with respect and help keep them in a condition that can be enjoyed by others over the next few years. Despite the illtreatment some visitors have bestowed upon Dambo's giants, Berheim Forest is encouraging the community to continue enjoying the forest dwellers with special events. On Saturday, May 18, Bernheim will host the Fe Fi Fo FunFest with discovery stations, a faerie village, costume parade, guided tree walks, food trucks, giant tree giveaways and more. The FunFest is $10 per car. Bernheim Members are admitted free with membership.